With Easter coming up, I obviously had to do a baking post. Sod the diet and give me all the chocolate is my excuse motto at Easter time! 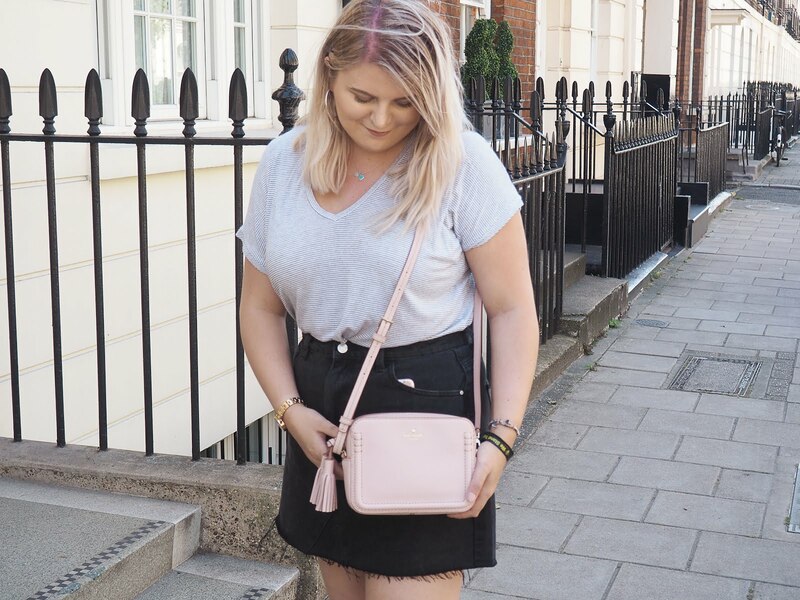 This post is gonna be extra special (and extra long) as I have 3 bakes to share with you all, I've been a right busy bee this week. Originally, the plan was going to be just make some cake pops decorated as bunnies but basically... They went horribly wrong. It's safe to say I probably won't be attempting cake pops again, they aren't worth the hassle! 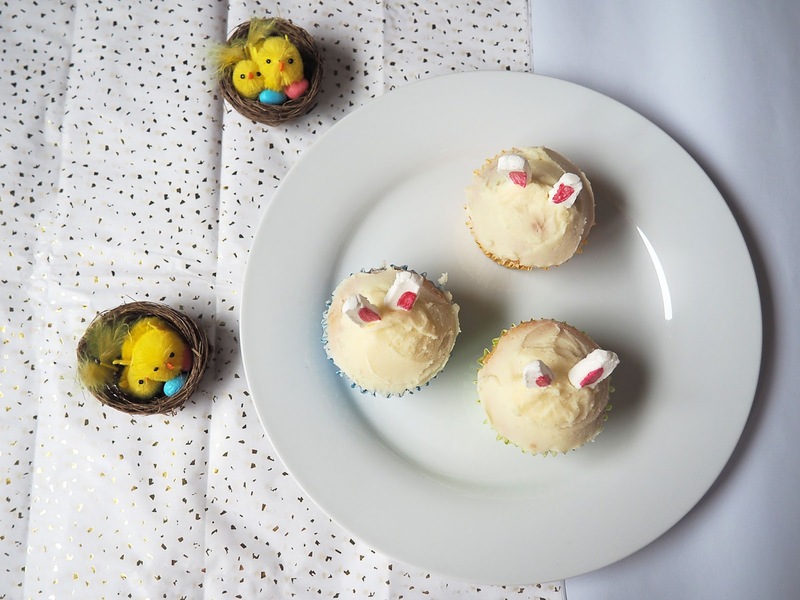 So instead, I did what I do best in an emergency and headed to Pinterest ASAP where I saw some adorable Easter cupcake designs, I was sold. Warning: I am not an artist, nor do I have a steady hand so my cupcakes aren't exactly Pinterest friendly. Shoutout to my mum for helping me and saving the day, once again! 1. Preheat the oven to 190c and line your muffin tray with cupcake cases. 2. Making sure that the margarine is room temperature, mix the flour, margarine, caster sugar, vanilla extract and eggs into a large bowl and whisk together. 3. Cut your cherries into quarters and stir into the cake mix. 4. Spoon your mixture into the cupcake cases ensuring the cherries aren't placed towards the top (this makes it difficult for decorating once baked). 5. Put in the oven to bake for 20 minutes or until the tops are golden brown. Now onto the tricky part... The decorating! I used a simple buttercream recipe for the base of my cupcake designs which consisted of 140g Soft Unsalted Butter, 280g Icing Sugar and a few drops of milk. Whisk them all together and there's your buttercream! 1. For my easy-to-do bunny ears cupcakes, I simply cut the large marshmallows into well.. A bunny ear shape (using scissors is easiest) and took a small brush to paint on the "pink" of the ears using the food colouring. 2. Simply place the painted marshmallows into the buttercream base and there you have yourself an adorable little cupcake. This little design was definitely the one that proved more difficult and as me and my mum both found out, making bunny paws from fondant icing is easier said than done! 1. 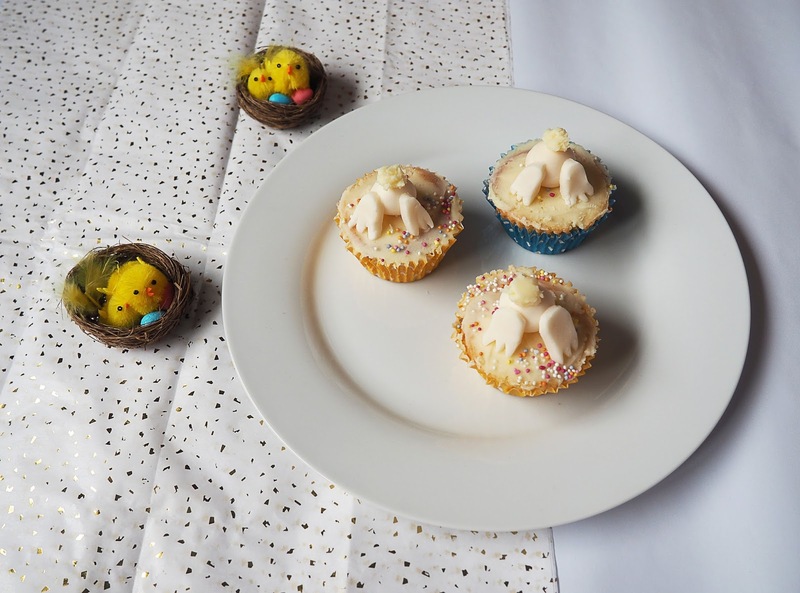 Once I had cut the tops off of these cupcakes to provide a smooth surface for the buttercream, I rolled the fondant icing into little balls to resemble a rabbit's body. 2. Roll out your remaining icing and using a knife, cut shapes out that resemble bunny paws. 3. Place the body onto the buttercream and attach the paws. 4. Finish with a little blob of buttercream on top of the body to create a fluffy tail and place sprinkles onto the buttercream to add a bit of colour. If you've made it this far down the post, honestly well done you! I didn't expect it to turn out so long (soz). I promise it's nearly over haha! For my final Easter bake, I decided to do some simple chocolate nests. I mean, they're pretty self explanatory really! 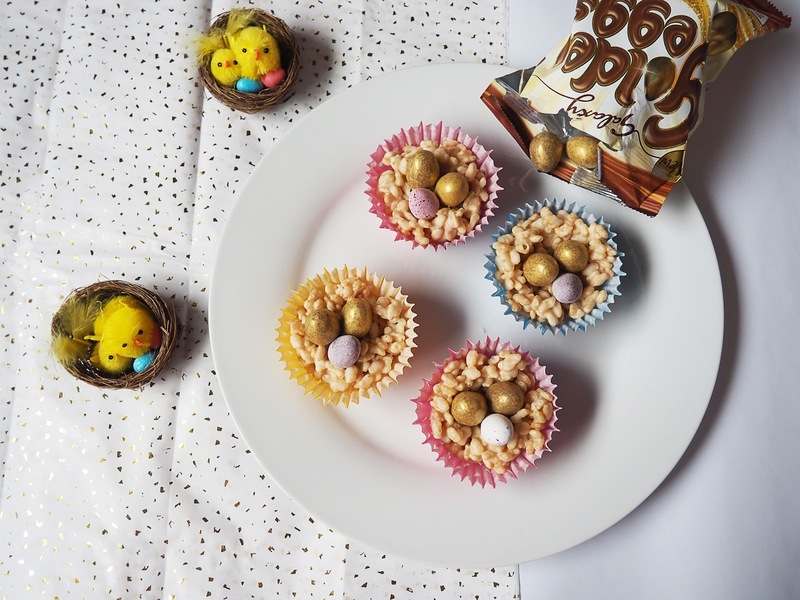 I added a little twist to my nests and instead of using your traditional milk chocolate, cornflakes and mini eggs, I went for white chocolate, Rice Krispies and Galaxy Golden eggs, because they're amazing. And that is it, we have reached the end of my mammoth baking post! *Pats you on the back* Can you tell I like baking? 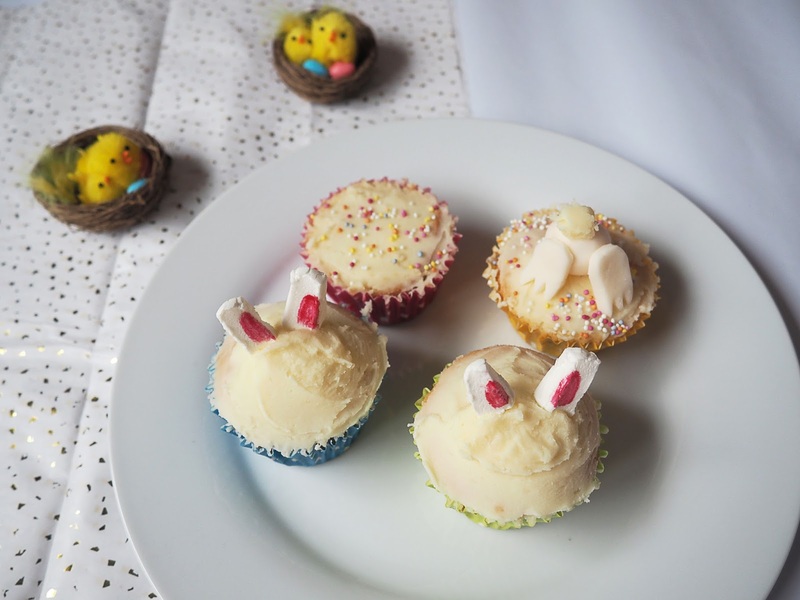 What Easter treats have you been baking this week? Have a very hoppy (lol) Easter and I hope you're all having a fab bank holiday! ah the cupcakes with the bunny ears are adorable! Aw the digging bunny cupcakes are so adorable!! Thanks lovely, I hope you had a great Easter! The bunny bums are my favourite, they're so cute! Ah how cute! 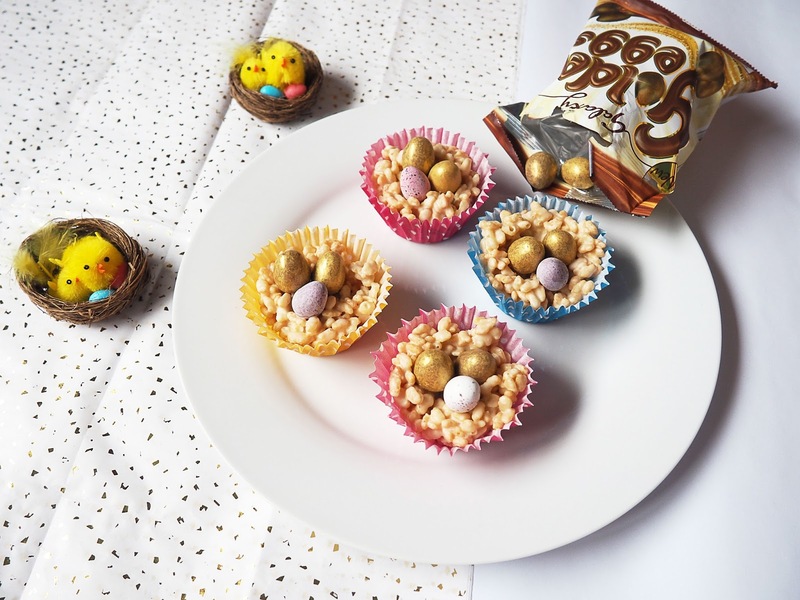 I got the urge to make some chocolate nests earlier... But I'm a bit too late on the buying ingredients front haha! You can never be too late! These are too cute! They sound delicious too. Kat, all these treats look so good! The cupcakes are just extra cute. Those are so cute! I have the same Easter mentality - no diet and all chocolate! Ok Easter has finished now but you can still make me some can't you? Pleeeease? Of course, Mary Berry back at it again! I always love it when you have baking posts up, hon! Makes my heart happy lol. Someone needs to get "bikini ready" oh so soon and someone isn't. That someone is me obviously. But guess what, these treats are too perfect to pass! You're amazing and so creative! Yummy! Thanks for the recipes hun, great post. Especially love the "digging bunnies"! I way too cute and they all look delish! 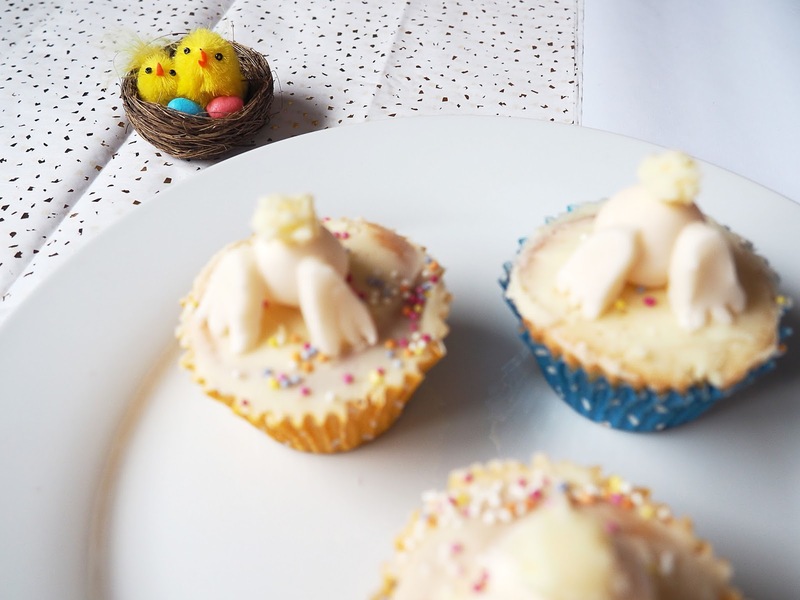 I need to find some time to do some baking soon I think..
those look so delicious and whether or not it's easter, this recipe is something I'm going to have to try out. so simple and delicious!